Come to the exclusive Amelia Island! This is the premium place to be! You're close enough to the action, yet able to retreat to enjoy the ambiance of this pristine and historic island. I've been renting my own property since 2004. Rent with confidence from the owner! This freshly painted condo features two bedrooms, two baths, and a fourth floor corner unit that has the most awesome views of this exclusive section of Amelia Island's beach. We've just completed a kitchen remodel with new cabinets, granite and a bar. Our balcony, unlike others, is an end unit- providing unobstructed views to the North, Oceanfront, and vast view to the South. Your only constraint is your own vision. Sip your morning coffee on the private balcony while incredible sunrises provided the backdrop for shrimp boats and porpoises. Our condo's panoramic view of the vast blue ocean and broad sandy beaches will keep you coming back here again and again. Being only steps away to the Ritz Carlton, you will enjoy the same beautiful beach as this world famous resort without the price! If you have never been to this island, you are in for a magnificent experience. Enjoy an uncrowded, breathtaking seascape from the dining area featuring large picture windows that offer an expansive view of the beach. It is also the perfect spot for using our telescope. The master bedroom features a king size Wesley Allen iron bed, new 42' flat screen panel LCD TV, and a beautiful beach vista as well. The guest bedroom has two queen beds with coastal bedding and its own 32" flat screen TV complete with DVD/VCR player. The living room has a new sofa and love seat. The entertainment center sports a 46 ' LED TV, Blu-Ray DVD player, a Bluetooth Stereo system, and over 40 movies available for your use. You will love checking your email using your technology on the comfortable balcony. We just added a Wifi extender to maximize effectiveness. This gated complex has two sparkling pools overlooking the ocean and four clay tennis courts free for your use on a 24 hour basis. The fully equipped kitchen with a side beach view also has a new full-sized washer and dryer. Centrally located, our condo is a three to five minute beach walk to the world famous Ritz-Carlton where casual and fine dining is available. The picturesque village of Fernandina, a 10 minute drive, is rich in history and is sure to satisfy all ages. Our island boasts wonderful restaurants, unique shopping experiences, antique shops, and a wealth of activities to explore. Don't procrastinate... We have many repeat guests so reservations tend to book early. As the owner and I want you to be comfortable with your booking. You can relax when you book with me. I understand that when you work, you want a stress-free getaway. Our condo is kept perfectly clean and exceptionally maintained. I am delighted to provide my personal favorites/recommendations so you can experience the island. Unlike real estate rentals, we come frequently to inspect It and add those things that make a vacation easy and memorable. The area is so pristine and the views inspire me each time I'm here. Don't neglect the off season. You will be pleasantly surprised how mild and lovely it is in the Fall and Winter. In my condo you feel like you've been to the beach just admiring the views. You don't even have to get sandy if you don't want to! This is especially nice for the elderly that just want to sit and relax. The views are amazing! If you so desire, enjoy a nice long walk on an uncrowded beach to renew your faith and clear your mind. In our kitchen you are going to find lots of money saving items that we keep stocked for your use. My husband and I both love to cook so we eat on the balcony frequently by candlelight. There are also tons of great restaurants on the island. If shopping is on your radar, there are many eclectic, unique shops on the island- especially on Centre Street. Awesome beach views from balcony, dining, kitchen, and master bedroom. Fabulous beachfront views make your vacation experience memorable. Sit back, relax, and enjoy the sight and sounds of the ocean. Right on the beautiful Atlantic Ocean! All linens provided for beds and bathrooms. All Bath Towels and beach towels are provided. A secured wireless internet access is available throughout the condo and balcony for your laptop, Ipad, or Smartphone. We even have a wifi extender- so no issues with connectivity here! There are only six units on our floor. We are an end corner unit on the fourth floor with breathtaking views. New sofa and love seat. New Stove with convection oven. A 12 cup coffeemaker and starter coffee for your first morning is provided. Our kitchen is fully equipped for even the most discriminating chef. Basic spices are even provided! Seating for six with a beautiful ocean view to enjoy while you dine. We have a new 46' flat screen LED in the living room, a 42'' flat screen LED in master bedroom and 36' flat screen LCD TV in the guest bedroom. New powerful radio, CD, Bluetooth sound system in the entertainment center. Hook to your own Spotify or Pandora in the living room. Blu-Ray in the living room. DVD/VCR in the guest room. Collection of James Patterson and other notable authors for a good beach read. Family card and board games available. Beach toys for the tots are plentiful. Don't buy until you check our closets! Over 40 DVD's available for your use. Beautiful views both north and south of the beach. Sit and listen to the waves or watch the awesome sunrises/sunsets. Boogie boards are almost always available in the toy closet! 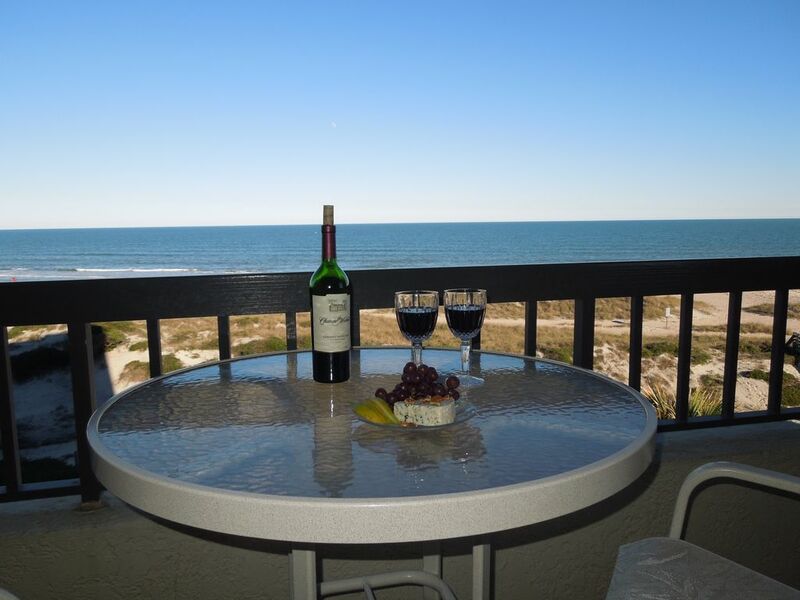 Private Balcony with great views, Telescope, Three flat screen TV's, Two VCRs, Blu-Ray DVD Player, Bluetooth Stereo, Dishwasher, Refrigerator, & new full-sized Washer and Dryer, Two full size pools, Four-24 hour Clay Tennis courts, Beach chairs, Beach towels and Linens provided. Absolutely no pets and no smoking allowed in this condo. Our family of five had a wonderful stay at Medea’s condo. The complex is lovely and the condo was very clean, well thought out for guests, and generously stocked with anything renters would need (including beach towels, chairs and toys). We took day trips to Cumberland Island and Fort Clinch, which were both spectacular. We also enjoyed a number of the restaurants that were recommended. Medea was a gracious host who was helpful and easy to communicate with. Loved our stay and hope to return one day. A lovely condo in a very nice gated community. Panoramic views from a lovely condo that is well equipped. Due to bad weather conditions and a family emergency, we never got to enjoy the beach or pool much. But we did get one good day. We rented chairs...Toby was wonderful...so accommodating. Also loved Historic Downtown Fernandina Beach....great little bistros and shops. Ciao and Cucina South were two favorite restaurants of ours. Also, if you’re a consignment shopper, FIFI’s...in the Harris Teeter Plaza...is a must do. Thank you, Medea for leaving such great info and directions on everything....and for being so understanding when we needed special consideration. It was a true pleasure! Thank you for your lovely response. The views are amazing from our unit. I feel so very blessed to be able to enjoy it and share it with others. We travel quite a bit and try to pick up tips from other properties to integrate at our place. Thank you for mentioning that. Amelia Island does have so much to offer! I often forget to include some of the great shopping, consignment, and antique stores. You were delightful to host and I’m so sorry you had to cut your vacation short. Please do return again. It is my honor to have repeat guests. Take care and God bless. My family had a wonderful time at this condo and beach. Clean, quiet, comfortable, fun, best ocean views, a great spot for our first time ever on this island. Used the dishwasher and washer/dryer once, easy. Great shower in master bathroom! Would only suggest one extra lamp by the couch for a little extra reading light. 3 nights was not enough and went by way too fast, as I would recommend at least one full week if you have the time. Communication with Owner is very easy and thorough. The big white notebook led us to fabulous seafood as well. Those ocean views from so many rooms is memorable! A great island to collect shells, too. So sorry we misplaced and lost one of the keys for the pool bathroom/tennis court/gate entry! Very beautiful condo with a fantastic view! Amelia island is a lovely spot. I hope you and your girlfriends had a wonderful time enjoying the amazing Island. There are so many things to do and so many things to see that you must come back again in the near future. I trust that you were able to go through the 3 inch notebook of all the restaurants, activities, and places of interest. I have found this to be very helpful for guest when traveling to a new vacation destination. Please return soon! Take care and God bless. We had a great time. Awesome location and beautiful beaches. The condo was great. Very neat and clean, wonderful views. Well equipped kitchen. Everything we needed. I’m thrilled you had a wonderful stay. I hope you were able to enjoy one of the many 86 restaurants on our beautiful island. Please return again in the near future and even consider a different season. I have to say every season has its advantages and beauty. God bless! Perfect unit in a perfect location! We enjoyed the unit and all of the amenities it offered as well as the amenities of the property. The view was amazing and we enjoyed the balcony as well. We would definitely rent again! Biking and Running Paths, Beach and Deep Sea Fishing, Horseback Riding on the Beach, Beachside Yoga, Banana Boat Rides, State Parks include Fort Clinch, Big Talbot, Hugenot, and Little Talbot, ferry to Cumberland Island or perhaps just do nothing!